This tutorial will show you how with the help of the popular HTML5 game framework Phaser and MightyEditor you can create your own game prototype. This tutorial will take about an hour and ~140 lines of code. The latest Google Chrome browser. Others are not tested and optimized. This tutorial also assumes, that you have a basic knowledge about MightyEditor and Phaser, thus the most basic terms won’t be explained in too much of a detail. Previous tutorials: Digger and SockMan. First, go to MightyEditor, click on “Create New Project” and fill in a name for the project. “Dungeon”, in this case. Download and extract the game assets and then upload them to the editor. The “00” in the name stands for the location of this room in the room array (there will be more rooms). Remember to change the coordinates of every room to X=0 and Y=0. 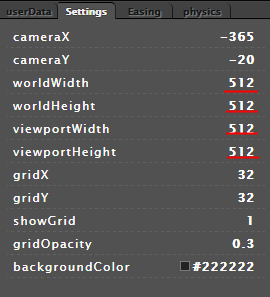 First, change the frame dimensions of “character.png” spritesheet to 50×50 pixels, anchorX to 0.5 and anchorY to 0.7. The anchorY of 0.7 and body size of 30×30 pixels means that any collision or overlapping will occur only with the feet of the character. Opening the game now would give you the starting room and character. Switch to the source editor and go to the demo state (js/state/demo.js). Everything will be done here. visited: a boolean flag for checking, whether this room has already been visited. Then create a location object with two members representing the current location of the character in 2D array, call the createRoom() function (more on that in the next step) and create the character and 4 members who help the game decide, which room to draw next based on the direction in which the player is going. And finally, we create character controls (arrow keys), although the actual controlling will be done in the update method. if has been visited: does no create this room from scratch, instead simply makes it visible again (upon leaving this room, it will be made invisible). Now, add an update method below create. This method is constantly looping itself at around 60 frames per second and is the place where the magic happens – physics checks, movement, changing rooms etc. In this method, the game first checks for collision with those tilemap tiles, which are flagged as having collision. Then there are the movement controls – changing the velocity of character depending on key pressed. And finally we check, whether the character is nearing the edges of this room and, if it is, calls the changeRoom() function. This function, when called upon moving the character towards a door, first makes the current room invisible, so its visuals can’t interfere with the room we are moving to (remember, that all rooms are located at the same coordinates on the map). Then, depending on the direction our character is moving, changes its coordinates in the array by 1 on either the Y or X axis. Finally, a new room is created and the character sprite is brought to top, so it is above any other game objects. Now you can open the game and explore your mini-dungeon. But that’s not all – a game needs a goal! 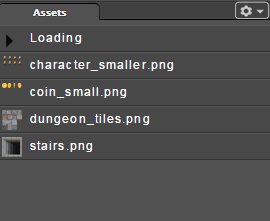 Return to the map editor and select the ‘coin_small.png’ asset. Change both of its anchors to 0.5, set its frame dimensions to 25×25 pixels and enable physics for this sprite. Now place the coins wherever you want in your rooms, similarly to how the rooms were created. Remember to group the coins between rooms, so, for “map11”, the coin group would be called “coins11”. Note – at the time of writing, if a tilemap object is included in a group and later created with mt.create(), the tilemap, even though it is rendered, it isn’t listed as a children of that group, thus collision checking becomes impossible. 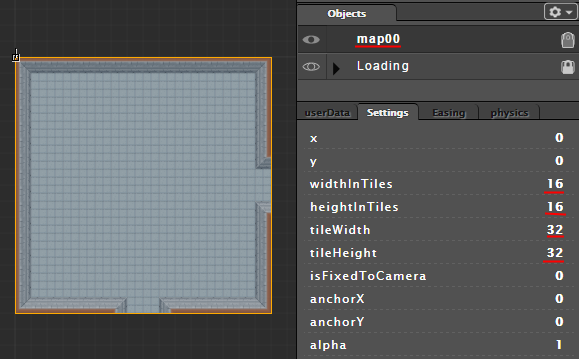 That is why coin groups and room tilemaps should be separate objects and grouped together manually in source editor – then tilemaps are properly listed as children of that group. 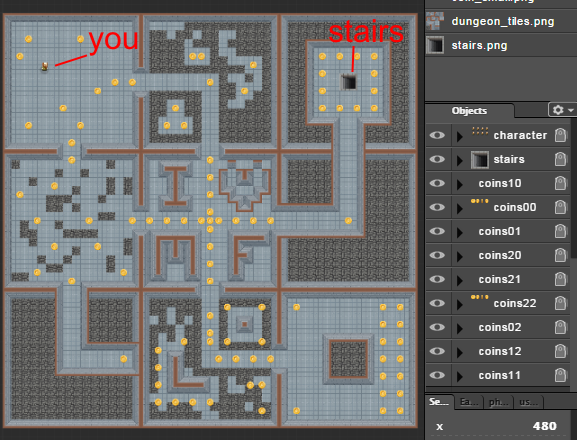 Also place the “stairs.png” sprite in of the rooms (with enabled physics) – those will serve as the end point of the level. 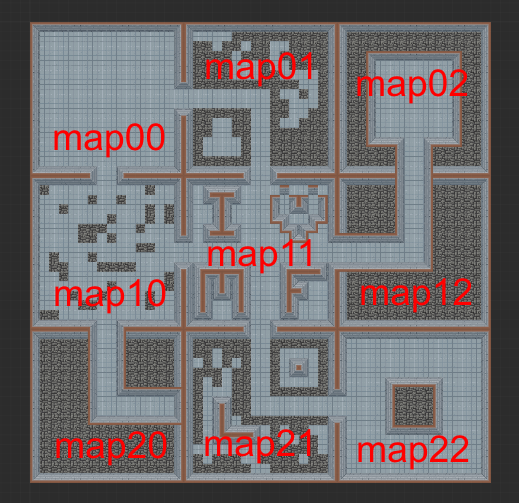 Remember to the coordinates of all groups and tilemaps to 0, so they overlap each other. The coordinates of stairs should be x=224, y=224. 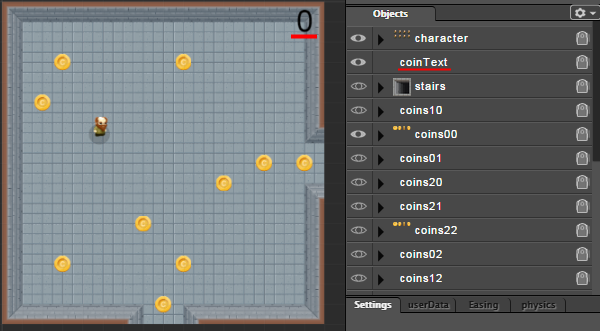 Finally add a text object with ‘0’ as its text, name it “coinText” add place it in the top-right corner of the room. This defines the frames used for each animation and starts the default animation. This plays an animation depending on the conditions of movement. You can also read learn about animations here. This adds the coin group to the same group which contains the tilemap for the room you have just entered. The animations are also created and and begin to play for each coin in this group. appears, the index next to ‘children’ means: 0=tilemap, 1=coin group, 2=stairs. Finally, we create the stair object if your character has entered the room which is supposed to be the end room (map02 in this case). The overlap function checks if the character sprite is overlapping a coin in the ‘coinsXY’ group and if it is, destroys the coin and adds +1 to the score (text objects are of char type, so parseInt is needed to convert the inner text to an integer and apply math to the variable). 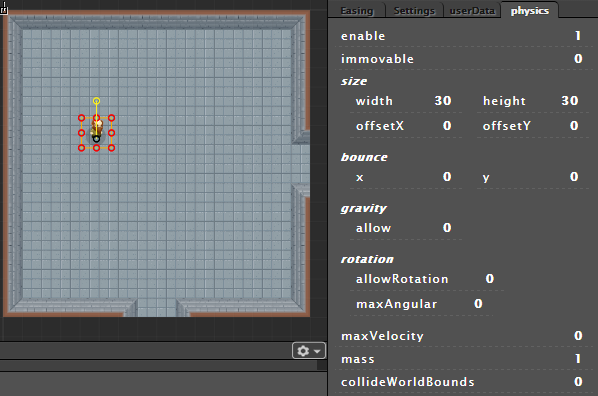 And the collision function checks for collision between character and stairs. If you have collected at least 30 coins, you win and get transported to the beginning of this game state (everything is reset). Congratulations! The game should now be fully playable! how do you know what the ID is?